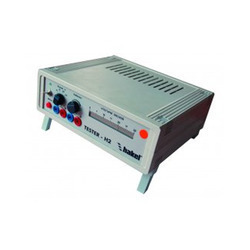 Our product range includes a wide range of gigatestpro, tester h1 - portable service equipment, tester h2 - portable service equipment, adapter h2.10, hvg15 and hvg20. 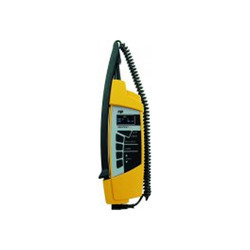 Portable service equipment intended for a quick diagnostics of operation efficiency of SPDs - class III, the device can be also used for a quick orientation control of SPDs condition - class I and II. Portable service equipment for quick diagnostics and operation ability of SPD - class III (all kinds of HAKEL data, communication and coaxial performance). Due to its friendly maintenance and wide versatility is using this appliance recommended at service and development workplaces. 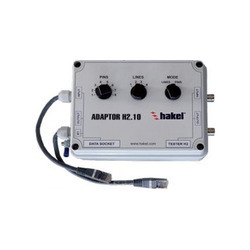 Optional supplementary equipment of TESTER H2 designed for control of data SPD fitted with RJ45 connectors at the input and output (or it can be fitted with RJ12 connector when using connecting reducers). 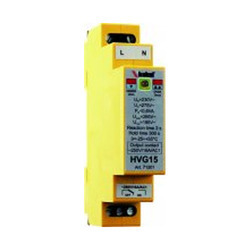 HVG is used to guard the voltage of singlephase low voltage networks. 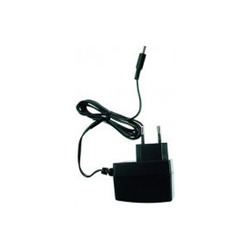 It monitors the voltage level and in case of deviation from the set values (lower and upper limit), it disconnects from the power supply by means of relay (with fixed set delay TR = 2 sec). This delay prevents erroneous response of output relay during the occurrence of parasitic flickers on the voltage curve of the monitored network. In the event of failure the HVG ensures abidance of error state with a fixed set time TH = 300 sec. 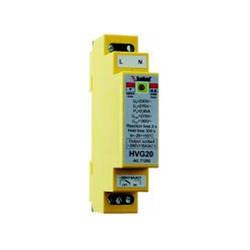 In-built relay is equipped with a change-over contact 250 VAC/16 A/AC1 which can be used for direct connection of the protected appliance to phase voltage. Models are supplied in a housing suitable for mounting on DIN rail 35 mm (1-pole design). Operating status is indicated by two LED diodes placed on the front panel → Green-normal, Red - undervoltage, Red(blink) - overvoltage. 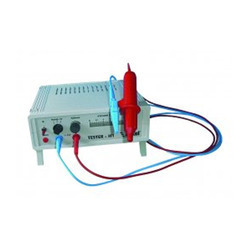 Note: In-built contact complies with the use for switching category AC1 (non-inductive or low inductive loads such as resistive heaters, etc.). In case of HVG applications in installations for switching of inductive loads (motors, electromagnets, valves, etc. 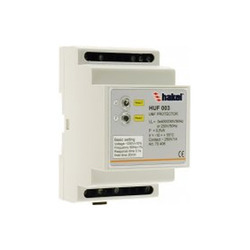 ), it is suitable to use the HVG in-built contact to control the contactors with acceptable dimensioned power contacts.